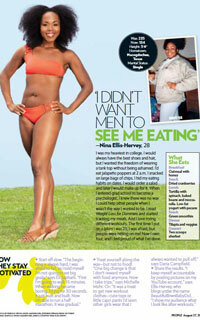 Nina Ellis-Hervey Makes People Magazine! Nina “BeautifulBrwnBabyDol” Ellis-Hervey is a young, multi-talented phenomenon. She is the true amalgamation of beauty, brawn and brains. Named one of the Top 5 YouTube Vloggers by the Huffington Post, not only is she one of the most popular naturals on YouTube, she’s a professor of psychology and one heck of a business woman! 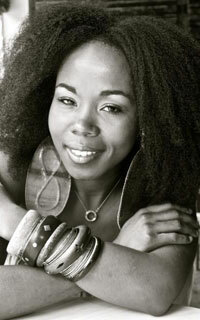 I first discovered BeautifulBrwnBabyDol via her YouTube channel in 2009 as I embarked on my healthy hair journey. She has big, thick, gorgeous hair, and I became a fan as I followed her helpful hair tips and styling tutorials. In addition to the healthy hair tips, she also shares her personal health lifestyle. 2006 was the beginning of her weight loss journey, and through hard work and determination, she went from 235lbs down to her now current weight of 134 lbs. Even more astounding is that she’s maintained this 100 pound weight loss for 6 years! Her remarkable story shows that you can accomplish anything with the will to achieve the seemingly impossible. Nina got a chance to shine and share her story with hundreds of thousands around globe as she was recently featured in the pages of People magazine. The popular vlogger shared some of her weight struggles as well as how she continues to stay motivated along her extraordinary journey. I think what is most amazing about her story is that she is so relatable to so many different people. She is a fantastic motivator, a role model and an inspiration to all who cross her path. It is becoming increasingly more evident how much of an impact the natural hair movement is making in society. Seeing more beautiful representations like BeautifulBrwnBabyDol in mainstream media can and should have a positive influence on both young girls and women around the world. I don’t know about you, but seeing these empowered images makes me proud to be a naturalista! Nina “BeautifulBrwnBabyDol” Ellis-Hervey will be teaming up with popular Houston natural hair group Naturally Happy Hair to bring a spectacular event to Houston. “Experience You Naturally” is coming to the Power Center on Friday, September 28th and will include guest speakers, hairstyling tutorials, giveaways and much more, so get ready to be inspired! You can also find her on her blog, www.beautifulbrwnbabydol.com.